LAPEL PIN BADGES in DISPLAY BOX! It depicts 3 original super heroes drawn just for this set. Limited Edition of 300 Made! Antiqued silver base metal pin are about 2 1/4 tall. Backs have HRC Logos pattern, boxed 5LC and tacs. This hot pin set is a great LIMITED. To your HARD ROCKIN' Pin. You will receive your Pins in mint condition. 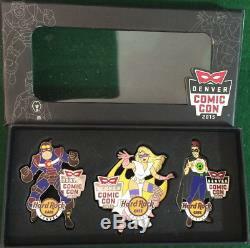 The item "Hard Rock Cafe DENVER 2015 COMIC CON Super Heroes Boxed 3 PIN SET HRC #84623" is in sale since Monday, June 25, 2018. This item is in the category "Entertainment Memorabilia\Music Memorabilia\Rock & Pop\Artists H\Hard Rock Café\Pins". The seller is "rockyourpinworld" and is located in Orlando, Florida. This item can be shipped worldwide.